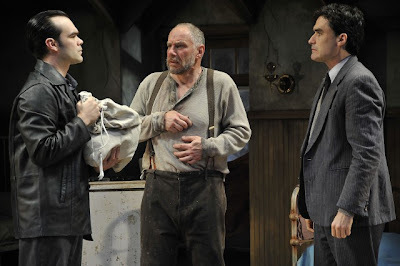 James Barry, Jonathan Epstein, and Tommy Schrider in the BTF production of Harold Pinter’s The Caretaker, directed by Eric Hill. Photo by Kevin Sprague. I woke up this morning feeling like I’d been rolfed by BTF’s production of The Caretaker. The odd thing is that I felt dispassionate while experiencing the play last night. Objectively, I thought the acting, directing, and production values were unassailably excellent, but I didn’t find the comedy particularly funny and I didn’t understand why the play itself mattered (even though I’d written a press release touting it as “a landmark of 20th century drama”). But this morning I woke up with Pinter’s language still buzzing inside my veins, feeling like the enigmatic power shifts that happened between the characters somehow realigned my meridians or chakras or something, like the play caused something to blow open in me on a cellular level. I always knew you were not an “ordinary” theater publicist, and you just proved it. What a spot-on analysis of last night’s production.